To helplessly watch as a child withers away to the devastating effects of cancer is an experience that no parent should have to endure. One Colorado mother decided, against the advice of her doctors, to focus on alternative treatment for her 4-year-old son, which she claims has completely cured him of a cancer that almost claimed his life. 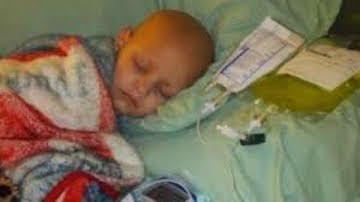 Sierra Riddle chose to refuse the vast majority of the chemotherapy that was ordered for her son Landon, despite the insistence of her doctors. That may seem unsafe or even negligent to some, however most are unaware of the overwhelmingly low success rate of the current go-to treatment of chemotherapy. According to a study in the U.S and Australia, chemotherapy provides a cure just under 3% of the time, leaving an astounding 97% of patients to suffer the tremendously painful and unnecessary side effects for the remainder of their short life with no benefit. Dr. Peter Glidden claims that chemo is simply a waste of money providing false hope. According to Dr. Glidden, chemotherapeutic drugs are the only classification of drug that allows the prescribing doctor to receive a direct cut of the profits. This is the primary reason a treatment that does not work is continually prescribed. These facts, along with the growing understanding of the healing powers of cannabis, moves many to completely surpass their doctor’s recommendation in search of alternative treatments. However, it is not the use of cannabis to heal her son that has many in an uproar, rather the fact that Landon continues to be treated with marijuana now. Dr. Larry Wolk, Executive Director and Chief Medical Officer for the Colorado Department of Public Health and Environment, fears what could happen if Landon continues to use marijuana. “I’m concerned because we don’t yet know what the potential harmful effects of vaping or eating those kind of products are,” Wolk said. Currently more than 200 children under the age of 10 now have medical marijuana cards in Colorado, according to CBS4. Figures from the state registry show 357 children under the age of 18 now have marijuana registry cards, and 110 of them are from 5 to 10 years old, with 104 between 1 and 5. This puts quite a damper on the common claim that the entire medical marijuana movement has been a guise to allow the partying masses to get high. Since the beginning of the cannabis liberation, many parents have made amazing claims about the success of treating cancer with cannabis, as well as many other illnesses. Despite the overwhelming evidence to support these claims, many continue to cast them aside as fabrications. Landon began his treatment with CBD oil that contains a very low level of THC. His mother maintains that this oil is what produced the curing effects which allowed him to be alive today. According to CBS4 Investigator Rick Sallinger, there was a visible difference in his health after the use of the oil. After Landon was rid of his cancer, his mother then began allowing him the use of a vaporizer to take his treatment. This is a device that uses heat to vaporize the psychoactive component within the marijuana, which then allows the user to inhale the THC vapor. The use of marijuana versus the CBD oil is where many take issue. Many question why Riddle allows her son the use of cannabis after the cancer has gone. Riddle said if she stops the marijuana treatments she fears Landon may suffer a relapse. Any parent who has watched their child suffer the rise and fall of cancer can fully understand the natural fears one can carry of the cancer’s return. Riddle said Landon was near death before the cannabis treatment. She claims the chemotherapy was making him sick, so she switched to marijuana oil and moved from Utah to Colorado. It has become a very common choice of parents with suffering children, to become what are being called “Marijuana Refugees” after they are told the current medical system can no longer help. After Riddle began to skip Landon’s chemo, Child Protective Services gave her an ultimatum — use the bottles of chemo medication or risk losing her child. “I took all of them in and I sat them down and (said), ‘Here are all these pills that you said he cannot live without,’ ” Riddle said. As far as Riddle is concerned, cannabis is the sole reason for Landon’s recovery. For many parents it is an easy choice when their child’s life is at stake. There are obvious risks with using a treatment that is regarded as unvalidated, but to these parents, the possible benefits vastly outweigh the potential risks. For many in Colorado, cannabis is becoming the new health food of choice. With more cases like this hitting the mainstream, it may move from heath food of choice, and become the answer to many daunting issues of today. Landon had a doctor’s appointment a few days after the CBS interview and it was his mother’s hope that he would get a clean bill of health and no longer be subjected to unnecessary chemo treatments. As of today, Landon is 100% cancer free. This confirms for Sierra that the cannabis cured her son of cancer, and for many, the truth that has been concealed for so long. writing this post, my husband is free from liver cancer and the doctor confirmed that the cancer was cured permanently. To all that seek for permanent cancer cure. Hey! I can,t believe this. A great testimony that i must share to all cancer patient in the world i never believed that their could be any complete cure for lung cancer or any cancer, i saw people testimony on blog sites of how cannabis oil brought them back to life again. i had to try it too and you can’t believe that in just few weeks i started using it all my pains stop gradually and i had to leave without the drugs the doctor gave to me. Right now i can tell you that for months now i have not had any pain, and i have just went for text last week and the doctor confirmed that there is no trace of any cancer system. Glory be to God for leading me to this. I am so happy as i am sharing this testimony. My advice to you all who thinks that their is no cure for cancer that is Not true, just get cannabis oil to cure your cancer and you will be free and free for ever, Try it and you will not regret it because it truly works. One thing i have come to realize is that you never know how true it is until you try. There is no harm in trying. Remember, delay in treatment leads to death. A great testimony i must share to all cancer patient in the world! I never knew CANNABIS OIL could cure cancer, i thought it was only meant to eliminate leukemia and Illinois paralyses, until 2 months ago, When i got a bottle of the oil, I bought them pretty expensive though, but had no option and didn’t want to loose my life just because of money..It turned out to be what i was looking for over 17 months, a week after buying the CANNABIS OIL it was like a reborn for me. Even my doctors were so amazed by its potency. I seriously advise that you also get yours, I am a living testimony of the wonder works of the cannabis oil and avoid going through life risking surgery. its 100% potent i swear..